This month's Ipsy bag is probably my favorite ever. I love this bag. The physical bag itself, actually: mustard yellow with a beautiful, glittery gold accent. It's much larger than the past few bags and I can see myself genuinely using it for travel. I also loved every single thing in my bag. Some were bigger winners than others, but there is nothing in this month's bag that I would not want to use. Let's dive in! This is a loose pigment eye shadow. Not my favorite way to wear eye shadow, to be perfectly honest! I find loose pigments to be incredibly, unnecessarily messy. However, this color is really pretty. It's kind of hard to describe; in the tin, it looks dark brown, but once you start layering it on, it's not very dark and is more of an iridescent copper color with a aqua blue shift. It's very pretty! It's definitely not an "I would wear that every day!" color because it is so hard to work with, but I do genuinely like it. I've been using it to highlight my inner corner when I go for darker eyeshadow looks. I just told Danny the other day that I needed a new blush brush--and look what's arrived! This is a pretty dense, medium sized brush that would be perfect for subtle contouring and applying blushes. I've stopped contouring recently (just so much work!) so I've been using this for blush; it gives me a lot of control over blush and the bristles are soft enough to blend well. I love a good lip balm (even though I do suspect lip balms are a conspiracy to make us spend money). This one is especially lovely because it has a wonderful berry scent. It is very thick and long lasting as well. I had a pretty bad cold this past week and I've been dabbing this on the skin underneath my nose to help it heal; it has been doing wonders! I love Tarte blushes so I was so excited to see this in my bag! I have the shade Paaarty (which was in the free Sephora birthday gift this year) and now I have Feisty. Feisty is a warm, tan color. Definitely more of a summer, bronzey look, but still lovely when mixed with a darker, more purple shade. Tarte blushes are so long lasting and creamy, it's really hard to go wrong with them! I'm a sucker for a liquid lip, so you won't be surprised to learn that this is my absolute favorite thing in the bag! Calypso is a dark, pink-tan shade that is so, so pretty; it dries down so smooth and lovely. It's not transfer proof, but it does look amazing on. I was so nervous about which shade I would receive, but I'm so happy with Calypso; it's the perfect lip to replace my summer favorite (Wet'n'Wild Liquid Catsuit in Rebel Rose). All in all, this month's bag is valued at $69.64. That's pretty good for a $10 subscription! As well, I like nearly everything in the bag! 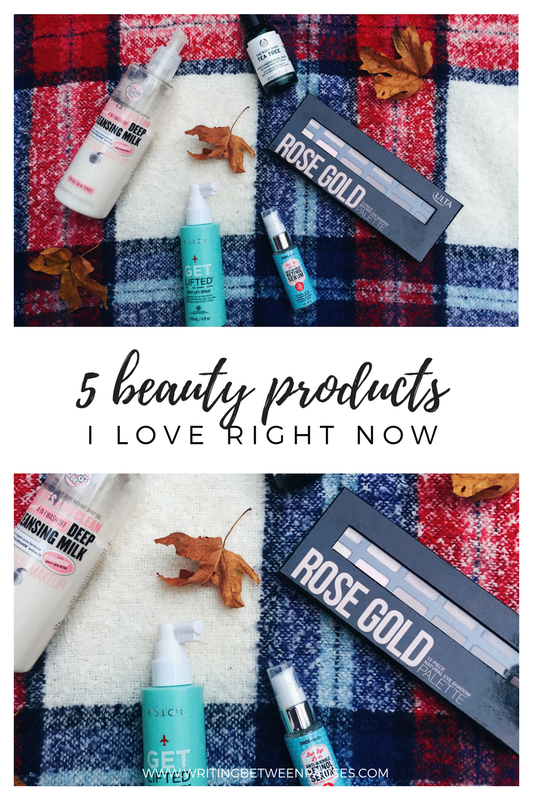 I would honestly repurchase any of these things, except perhaps the loose pigment eyeshadow; that is something that I would probably try to find in a dupe version! But I’ve also been loving Blogtober—having the chance to write all these posts that I’ve always wanted to write… like putting together my favorite outfits, finding new beauty products, sharing the best tutorials I’ve pinned on Pinterest… it’s been a lot of fun! I decided to take it easy on myself with this post. I love Halloween make up; it’s my favorite time of the year because, duh, Autumn, but also, Halloween and spooky-themed everything is so much fun. Here’s a round up of some of the cutest, most fun, and most spooky beauty products. Before every busy Halloween, we all need a little self-care. This pumpkin-shaped bath bomb is scented with “exotic pimento, sweet vanilla and cozy, warming cinnamon,” and promises to turn your bath water a pretty, pumpkin orange. What could be better? Press on nails are not something I ever thought I would recommend… or wear. But I really love imPRESS nails—I went through a phase of wearing them every week a few years ago (post-baby it’s much more difficult to rock a long nail) and they always last 7+ days. Seriously. 7+ days! These ones feature a gray-and-white matte color scheme with a spooky church yard and several glitter accent nails. Perfect for a subdued Halloween look. This is such a fun lip kit! It features 1 matte liquid lipstick and a matching liner so you can contour your lips (or just prevent feathering—hello aging!) in the color Vampire Night, a rich, bloody burgundy color. Perfect for a vampire costume or just for fun.